As usual on 25th of every month, I’m happy to let you know that there is an addition to my free desktop wallpaper collection. This time it is an image from Bryce Canyon National Park (Utah), which I visited almost 2 years ago. Magnificent place! I remember, I was ready to spend days and nights roaming among those rock formations, also known as hoodoos. 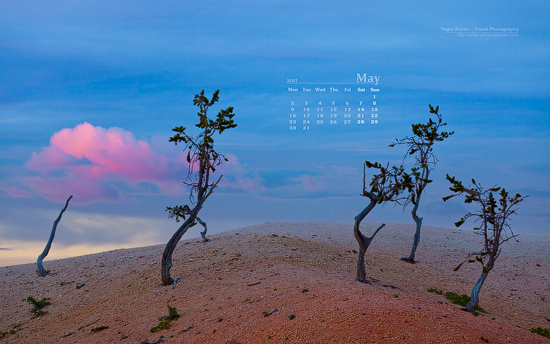 I am sure it will not be a surprise for my regular readers that this and older wallpapers with updated calendar are available for download here: Free Desktop Wallpaper Calendars. Over 100 images form my portfolio are also available as high resolution wallpapers for Android devices. BTW, there were a lot of updates to my Android wallpaper App recently – it now understands Flickr, Facebook and Picasa, so you can use your own images and wallpapers from my collection at the same time.